IC Insights has reported its market research findings, where it estimates the total Opto, Sensors/Actuators, and Discrete semiconductor/device (O-S-D) sales of $58.6 billion in 2013, surpassing the previous peak of $58.2 billion in 2012, when revenues also grew about 1% from record levels in 2011. In many ways, 2013 was a slightly weaker repeat of 2012 with all three O-S-D market segments being undermined by the shaky global economy and high levels of caution among systems makers, who reined in component purchases and kept inventories low. During 2013, the biggest and typically fastest-growing product categories in optoelectronics, sensors/actuators, and discretes suffered from slowdowns in unit-volume demand and sharply lower selling prices. However, the new O-S-D Report’s forecast shows the two-year slump ending in 2014 with all three market segments gaining strength over the next several years as the global economy improves and unit demand bounces back (see Figure 1). IC Insights expects total O-S-D revenues to rise by a more normal 8% growth rate in 2014, reaching a fourth consecutive record-high level of $63.5 billion this year (with optoelectronics growing about 9% to $31.6 billion, sensors/actuators climbing nearly 14% to $9.9 billion, and discretes recovering from a two-year decline, increasing 6% to $22.0 billion). The 2014 O-S-D Report shows all three O-S-D market segments steadily gaining momentum until 2017, when the next economic slump is expected. After growth slows to about 2% in 2017, total O-S-D sales are projected to rise 6% in 2018, reaching $86.4 billion, which represents a compound annual growth rate (CAGR) of 6.4% in the five-year forecast period of the new report. The 2013 slowdown in O-S-D growth was unusual in a number of ways. For the first time in six years, O S-D growth lagged IC sales—0.7% versus 4.7% for integrated circuits, which got a tremendous boost from a 32% increase in DRAM revenues during 2013. Despite weaker growth, combined O-S-D sales accounted for 18.0% of the semiconductor industry’s total sales of $325.1 billion in 2013 compared to marketshares of 16.0% in 2003 and 14.6% in 1993. On the strength of optoelectronics and sensors, total O-S-D sales have outpaced the CAGRs of ICs since the late 1990s and have gained more marketshare over the past two decades. In the next five years, the return of stronger sales growth is expected to increase O-S-D’s marketshare to nearly 20% of the projected $440.5 billion total semiconductor sales in 2018, which will be the highest percentage since 1988, according to the new report. Another unusual aspect to 2013 was that all of the biggest O-S-D product categories struggled in the year (see Figure 2). In optoelectronics, sales of lamp devices—primarily light-emitting diodes (LEDs)—grew just 7% in 2013, the lowest rate of increase in 12 years, primarily due to a slowdown in high-brightness LEDs for backlit televisions and falling prices from excess capacity in HB-LEDs. The good news for HB LED makers is that lower prices for lamp devices should eventually help lift sales for new solid-state lighting applications, which will use up the excess capacity in the next few years. Image sensors—the second largest optoelectronics product category behind lamp devices—suffered a 4% decline in sales due to steep price erosion in CMOS imaging devices. Meanwhile, total sensors sales were up by just 3% in 2013 with acceleration/yaw sensors falling 2%—the first decline for this product category in eight years—and a 1% drop in magnetic-field sensors. Actuators sales also fell 4% in 2013. 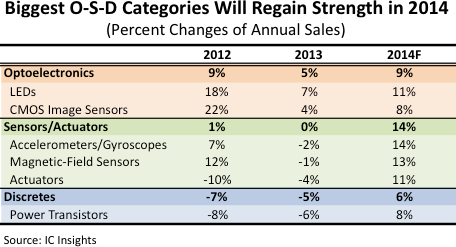 In discretes, power transistors continued to struggle in 2013 with sales dropping 6% after an 8% decline in 2012. It was the first back-to-back annual sales decline for power transistors in more than 30 years. Among the 2013 bright spots in the O-S-D markets were optical network laser transmitters, which saw sales surge 48% to $1.0 billion, and pressure sensors, which climbed 18% to a record-high $1.3 billion last year. Laser transmitter growth is being driven by strong investments in high-speed optical networks, which are needed to keep up with worldwide increases in Internet traffic, tremendous growth in video streaming and downloading transmissions, and the spread of new online cloud-computing services. Pressure sensor sales were driven higher by strong demand from the automotive industry and new end uses in portable systems (such as smartphones and wearable personal activity trackers) and medical applications, according to the 2014 O-S-D Report. Based on the new report’s forecast and analysis, the strongest growth drivers in O-S-D during the next five years are expected to be: high-brightness LEDs for solid-state lighting; laser transmitters for faster optical networks; MEMS-based accelerometers, gyroscopes, and pressure sensors for highly adaptive embedded control and location-aware cellphones and other portable systems; CMOS imaging devices for machine vision, medical systems, and new human-recognition interfaces; and power transistors for hybrid and electric vehicles, energy-saving electronics, and more efficient battery management solutions.